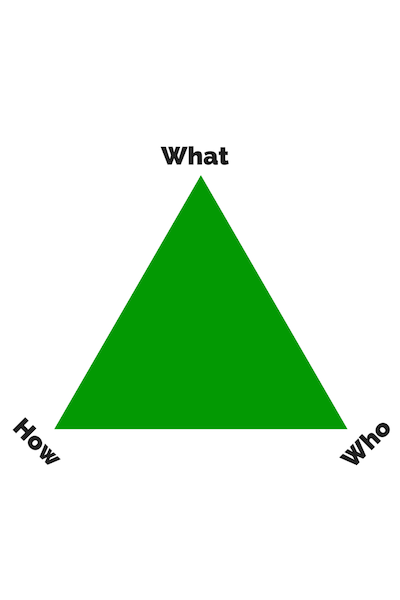 Redefining the project management triangle. Redefining the project management triangle..
One of the big business cliches is the Project Management Triangle. The triangle has three points: Quality, Speed and Price. That is, you can have something done fast and cheap, but the quality will suffer. Or you can have it done good and cheap, but it will take a long time. Companies have often used this rubric to evaluate vendors and agencies for all sorts of projects; we come up against it quite often at MojoTech. The triangle is meant to help you determine the value of a project and who the right person or team is to execute the project. The problem is that it’s not all that helpful in doing what it’s supposed to do. In reality, the only time you truly get to “pick two” is if you want something fast and cheap (and not good). The best in any industry don’t come cheap, and they shouldn’t. Great work is time- and resource-intensive to do. Stellar work doesn’t happen overnight, no matter how much money you throw at it (there are extreme exceptions, but most of the time this is true). If you want great work, you need to be prepared to wait a reasonable amount of time for it. So, yes, you could “pick two.” Fiverr and much of the freelance marketplaces like eLance and oDesk are great examples. But if you want top quality, you can only pick one. This applies to any industry where top quality delivers outsized returns, like in the case of an agency building your product. If quality matters, pick one. In any case, the Quality-Speed-Price triangle is not the best way to choose the right agency. What’s More Important To Know Than Quality, Speed and Price? Over the years, I’ve seen agency proposals evaluated in hundreds of different ways. I’ve evaluated many myself. The truth is, most potential clients already know about the Quality of the agencies they’re considering. They’ve seen enough of the agency’s past work to make a reasonable evaluation. Speed isn’t necessarily the right question to start with; it’s easy to overpromise speed, and then compromise quality later on to stick to an agreed-upon deadline. And Price, among agencies of similar Quality, is simply a function of Speed. The Quality-Speed-Price triangle doesn’t tell you anything particularly useful about the differences among agencies. The evaluation method that I find most useful -- and that I think is the best predictor of a project’s potential for success -- revolves around the What, How and Who of the project. What: what’s the real scope of the project that the agency is proposing? Not just a feature list, but a full scope: will it be original work? Will it rely on expensive third-party services? Will it be a custom job, or an an amalgamation of existing code that “sort of” delivers the desired feature? Critically, what will it not include? Is the agency proactive about encouraging you -- at their expense -- to leave out parts that will not be valuable to you and your customers? How: how will the agency get your project from start to finish? What technologies do they plan to use? What’s their process for product development, and how will they ensure that the product meets the needs of your customers? Will the agency give you full access to the production process, and help you understand how to easily take over the development or maintenance with an in-house team at some point in the future? Who: who, exactly, will be doing the work on your project? Have they (the people, not the agency they work for) done similar work before? Will they understand the intricacies of your business and your customers? And most importantly, can you actually meet or speak to them, and will you be able to work directly with them? Ask these questions to any agency you’re considering working with, and then compare the answers they give you. What you learn will be far more revealing, helpful and predictive of success than choosing based on Quality, Speed and Price.